Each section meets the Florida 1 hour specialty requirement in clinical chemistry. Section A also meets the 1 hour serology/immunology and 1 hour administration/supervision requirements. Section C also meets the 1 hour serology/immunology and 1 hour administration/supervision requirements. For ASCP, Section A provides 10 hours in clinical chemistry, 1 hour in serology/immunology and 1 hour in laboratory management. Section B provides 12 hours in clinical chemistry. Section C provides 10 hours in clinical chemistry, 1 hour in serology/immunology, and 1 hour in laboratory management (NOT laboratory safety as the catalog states). 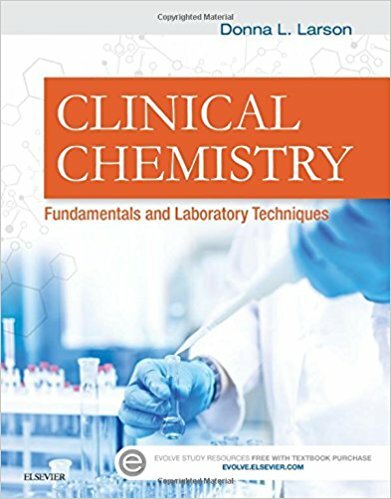 Clinical Chemistry: Fundamentals and Laboratory Techniques provides a thorough review of current clinical chemistry theory and procedures. The level is basic. Safety • Instrumentation • Immunoassays • Molecular Diagnostics • Automation • Quality Management Systems • Enzymes. Clinical Chemistry and Disease • Cell Injury and its Relationship to Disease • Inflammation • Body Fluids and Electrolytes. Part 2, continued: Blood Gases and Acid-Base Balance • Blood Diseases • Proteins • Cancer and Tumor Markers • Blood Vessel Diseases • Heart Disease • Respiratory Diseases • Gastrointestinal Disease • Diseases of the Liver • Pancreatic Diseases and Disorders • Endocrinology • Kidney and Urinary Tract Diseases. Part 2, continued: Reproductive Diseases • Pregnancy • Bone, Joint, and Skeletal Muscle Diseases • Skin, Hair, and Nail Diseases • Eye and Ear Diseases • Nutritional and Metabolic Diseases • Immune System Diseases. Therapeutic Drug Monitoring • Toxicology • Transplantation • Emergency Preparedness.